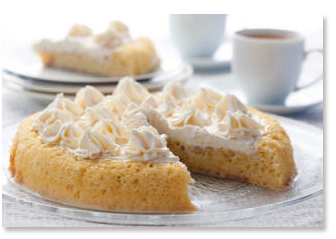 In recent times the Tres Leches cake or Pastel de las Tres Leches became one of the most popular Mexican Desserts. It is a sponge cake in many recipes, or a butter cake, soaked in three kinds of milk (thus the name of Tres Leches): evaporated milk, condensed milk, and heavy whipping cream. Preheat oven to 375° F. Butter and flour a 9 x 13-inch pan or a glass Pyrex if you’d rather not remove the Tres Leches bread from the pan. Beat half the sugar and all egg whites until mixture peaks at a medium to high speed. In another bowl beat the remaining sugar with the egg yolks until you get a light yellow mixture. Slowly add the sifted flour and beat until you obtain a smooth batter. Pour batter into the baking pan. Bake for 15 to 20 minutes, until a toothpick comes out clean when inserted in center of the cake. Cool down to room temperature. Prick the entire top of the cake with a fork. This will enable the Tres Leches mixture to be fully absorbed by the bread. In a blender, mix evaporated, condensed, whole milk and sugar. Beat the whipping cream, vanilla and two tablespoons sugar until it forms peaks. Spread the whipped cream over the cake and chill before serving.